My latest project has been to replicate a first edition from 1897, combining traditional production values with the most up-to-date digital technology. This is an unusual publication, bringing together two books that were published more than a century apart and by two very different writers: WB Yeats’ book of talismanic short stories, The Secret Rose (1897) and my novel, Her Secret Rose (2015), based on the story behind those stories: Yeats’ famous love affair with his muse, the English heiress turned Irish revolutionary, Maud Gonne. 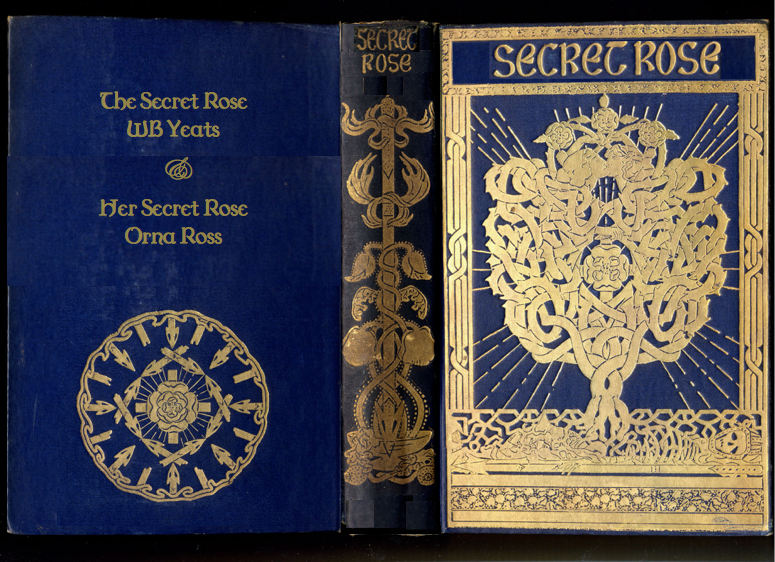 To highlight Yeats the fiction writer and The Secret Rose stories in particular. I think they have far more literary value than is generally acknowledged. To bring these stories together as their author originally intended. Yeats was an “indie author” in that he took an interest in every aspect of his books’ publication, from concept to promotion. The stories in this book are a careful blend of old and new, Christian and pagan, and he had intended them to climax in two stories of occult power. But his publisher took fright and would only publish if those final two stories were omitted. As these form a climax toward which all the other stories were aiming, this must have been devastating to Yeats. To bring the stories to a new readership, using my novel, the story behind the stories, as an accessible introduction. To use digital technology to make a beautiful print book. The nervousness it all engendered I’ve come to recognize as what I call “creative ferment”, something to work with. And what more fitting way to celebrate this great poet and, less often acknowledged, great storyteller than with a commemorative book that would reinstate his original vision, when he was still the controlling and confused young genius depicted in the novel? Meanwhile, I was deciding which version of Yeats’ stories we should use. Yeats was a determined reviser and his vision for The Secret Rose, where he had to unite so many different occult preoccupations and traditions, had him revising right up to a frenzy of last-minute proof corrections. And after publication, the rewriting went on. I actually like the languorous, druggy, Pateresque prose of the 1890s, and find it transports me to the otherworld more effectively than Lady Gregory’s “Kiltartanese”, but I wasn’t going to issue the work in language Yeats had come to hate, so I used the Gregory-revised versions of the texts. I restored the two stories axed by the publisher but also removed two of the weaker tales that Yeats had later pulled, and substituted a later story, “Red Hanrahan,” for the 1890s version. In short, I put together the combination that I think would have put a smile on Yeats’s 33-year-old face. Once it became clear that the crowdfunding campaign was going to succeed, (it was 106-percent funded on completion), Yen’s mock-up cover design went to Jane Dixon-Smith (pictured), to reproduce in a format that the printer could use, to set-up the blocking dies needed to stamp its the navy cloth bound pictorial boards in intricate gold foiling. An expunged passage from “Rosa Alchemica”, a definitive story in The Secret Rose, which can be read in the page proofs in the Varorium edition by Prof. Warick Gould, describes an ancient "ritual manuscript" as having a cover showing on one side "a rose-tree growing from an armed anatomy, and enclosing the faces of two lovers, to symbolize certainly the coming of beauty out of corruption, and probably much else”. And on another: "The alchemical rose with many spears thrusting against it, but in vain, as shown by the shattered points of those nearest." 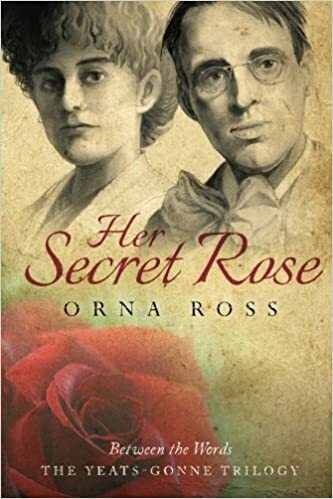 This is the cover that Althea Gyles set out to create, or had already created when Yeats was writing that passage, and the cover that we set out to reproduce for Secret Rose. Together, they blended their Kabalistic and Rosicrucian teachings into two popular art styles of the time: art nouveau and Celticism. The skeleton of a knight lies supine under a straight line that probably stands for the veil separating earthly from ethereal existence, helmeted and with a spear in his left hand. From the pelvic bowl originate roots that become intertwined branches, weaving and interweaving like the border of a Celtic medieval manuscript, into the shape of a Kabalistic Tree of Life. The intertwined foliage creates the faces of two lovers kissing, while their hands rest on the rose and cross at the centre of the tree. This is the Rosicrucian emblem of the rosy-cross: the cross representing male energy and physical conflict and suffering; the rose representing female energy and metaphysical love and beauty. The tree is surrounded by seventeen broken luminous rays and above the two lovers, the intertwining branches of the tree forms a crown containing three roses, in replica of the three higher emanations atop the Kabalistic Tree of Life, with the central emanation slightly higher than the others. The spine shows a spear sinking into a bowl which, suggests Professor Warwick Gould, is best thought of as a chalice. Vegetation grows from the chalice and interweaves around the spear, which may also be imagined as a phallic symbol in union with the female cauldron. The mandala on the back of the book shows the rosy-cross casting twenty-eight rays, seven emanating from each of the four angles formed by the the cross, some broken. This image is included within a two-line wavy circle, with the many spears “thrusting against it, but in vain”, shattering as they approach to form the four sides of a diamond, each side being made of the converging tips of two spearheads. The reiteration of various opposing couples on front, back and spine — the rose and the cross, the lance and the bowl, the rosy-cross and the spears — symbolise the opposition between spiritual and material life, between eternity and death. For adepts like Gyles and Yeats, the rosy-cross is the mystical melding of all oppositions, attained only by initiates who fulfill their life’s purpose and attain enlightenment. Away from all this esotericism, Yen and I were whittling down the choice of printer and finally settled on Clay's, largely because of the wonderful Rebecca Souster (pictured). The interior of the original book was a thing of beauty in itself, with its wide margins and elegant font and reminder on each page of which story you’re reading. It was printed on laid paper, a thick paper that had served to fill out a slim volume of stories. Ours was a much longer publication and we wanted it to be light and proportional. Laid paper, or an equivalent which we also explored for a while, would make too bulky a book. Such papers are also impossible to use in digital printing presses. And the more we explored, the clearer we became about wanting to use the digital process, which would allow us to use long grain paper, where the grain of the paper runs perpendicular to the spine. This allowed the book to fall open in a way that suited the offset text on the page. Jane and I had set the text with a very wide right hand margin (43mm) in replica of the original, as it allowed the titles of Yeats’s short stories to be written in the margins. This made the left-hand margin tight and the fall-open of the book very important, sealing the deal for digital. So we went for a soft, light cream, modern paper — Ensocreamy — that fulfilled all the requirements. Just as with the content, the intention was not to produce a straight copy, but to be as true as possible to what he would have wanted for his book, were he here today. The improved production opportunities afforded by digital processes would have delighted the young Yeats, I believe. Of course, I can’t know for sure how he would have felt about this project but I’m happy we’ve done the great man justice and am profoundly grateful to all who helped, from the academics whose work is the scaffolding on which this book was built, to Yen, Jane, Rebecca and of course, all those who supported the crowdfunder. Last words to Rebecca: ”Together we made a stunning book. And, for me, that is the most important and rewarding part of working with authors." This story originally referred to a programme at the London Irish Centre which, in addition to Orna Ross, featured: Yeats Society immediate past president Damien Brennan; Young Poet Laureate to London, Aisling Fahy; Irish Sen. Susan O'Keeffe (chair of #Yeats2015); UK Irish Amb. Daniel Mulhall; and jazz vocalist Christine Toibin. Here is more about it. Orna Ross speaks at the Novelists Inc. Conference at St. Pete Beach, Florida, in the First Word day programme and general conference, 1-4 October.